Should the Lions Fire Jim Schwartz? My latest for Freakonomics looks at the impact of changing coaches. 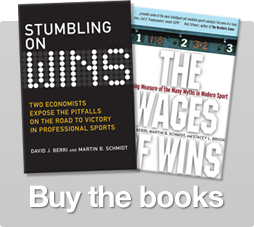 Studies of college football, various soccer leagues, the NHL, and NBA all tell a similar story. Teams that change coaches do not see systematically better outcomes. As I note, these results echo the sentiments of Adam Smith. And as I noted, these results indicate that there is little difference in the quality of coaches in these sports. At the moment I am not aware of a similar study of the NFL. I suspect, though, that the story in the NFL would be similar. So with that suspicion in mind, let me briefly comment on the sentiment that the Detroit Lions should think about replacing Jim Schwartz. the Lions are second in yards per game. the Lions are 12th in yards allowed per game. According to Advanced NFL Stats, the Lions are currently 14th in the Efficiency Rankings. Last week the Lions were 12th. In sum, the Lions – except for their record – look pretty good. the Lions have given up 10 touchdowns on returns (4 interception returns, 2 fumble returns, 2 kick-off returns, and 2 punt returns). No other team has given up this many points on returns. Another interception return put the Cardinals on the Lions 3 yard line. The Cardinals scored two plays later. A muffed punt put the Cardinals on the Lions 5 yard line. The Cardinals scored on the next play. The Lions turned the ball over on downs in the 4th quarter at their own 29 yard line. The Cardinals scored two plays later. Add it up and the Cardinals scored 5 touchdowns while their offense only moved the ball 37 yards. Now is all of this the coaches’ fault? Interceptions – as noted in both The Wages of Wins and Stumbling on Wins – are very hard to predict. One suspects that turnovers that are turned into touchdowns are also hard to predict (and I doubt teams make sure their offensive players are great at tackling – although I could be wrong on that point). Had the Lions been better with respect to turnovers and returns for touchdowns, their record would definitely be better and likely be more consistent with the efficiency ranking at Advanced NFL Stats. And I would add one more observation from Advanced NFL Stats. The Lions have had eight games this season were the probability of the Lions winning was 75% or better in the 4th quarter of the game. In these games, the Lions are 4-4. Had the Lions simply won these games the team would currently be 8-6, and Schwartz would not be anywhere near a hot seat. Detroit’s challenge this offseason is to bring in guys who have won, know how to win, and have enough leadership qualities to turn around the history of losing in this franchise. One often hears this argument about losing teams. The key is to find “winners”. This argument, though, doesn’t really provide much of a guide to decision-makers. How does one find “winners”? Is it simply players who played on winning teams? How do you know that the player in question was the reason his team won? Or let’s put it this way. Calvin Johnson has played for a losing team much of his career. So I guess he can’t be thought of as a “winner”. But would most NFL teams pass on the opportunity to have Johnson on their team? The problem with coverage of the Lions is that journalists are very unwilling to embrace the notion that luck and randomness plays an important role in football. And furthermore, coaches can’t really change luck. My sense is that the Lions have simply suffered from bad luck. And I think (or at least, I hope), next year this team will have better luck. If that happens, whoever coaches this team will look good. If that is Jim Schwartz, these same reporters will likely be changing the story they tell about the Lions and their coaches. And the players the Lions have will suddenly be thought of as “winners” (who reporters for other losing teams will wish their teams would hire). 7 Responses to "Should the Lions Fire Jim Schwartz?" I think this says all you need to know about “winners”. Gotta love the advice that the team needs to “acquire players who know how to win”. I am sure none of the other 31 NFL teams are trying to do that, after all, so players like that must be practically growing on trees! How about his challenge flag error that gave the Texans a free touchdown (and eventually a win)? When I hear “we need winners” I think of role models / professionals.The back up linebacker of the Rams that made the tackle at the 1 yard line (name?) come to mind. They just help create a positive atmosphere, ensure people work hard, and calm people down in big games. Doesn’t matter how bad they are because they shouldn’t be playing much anyway. The talented do. It’s the same in basketball when teams look for guys like Fisher or Scalabrine. The writer doesn’t deal with another fundamental issue that relates to success . . . discipline. And that is an issue that relates directly to the coach. The Lions had several (7, I think) arrests during the offseason prior to this season–no personal discipline. Their defensive superstar Suh can’t control himself on or off the field–no personal discipline. Multiple mental errors are made by the players throughout the season (evidence the punt return blunders of Logan). Even the coach himself seems to lack the mental and emotional discipline off a winner. Not saying that this is all Schwartz’ fault or even that he should be fired (though it wouldn’t disappoint me!). Just saying the Lions are simply victims of bad luck is over simplistic. How about penalties? Offsides, holding, pass interference, too many men.. Blah blah blah.. Same story. There’s no excuse with the talent on that team. Only shaky position is secondary. We gonna turn Calvin Johnson into the next Barry Sanders?